Kerri Okula is a very happy to begin her second year teaching in the Learning Lab at Divine Wisdom Catholic Academy for the 2018-2019 school year. She is looking forward to the opportunity of meeting and working with the talented students in all grades. Kerri graduated from Hofstra University with a B.A. in Psychology. Following graduation, Kerri began working with students with special needs. Teaching these students helped guide her into continuing her education at Hofstra University and receiving a Masters degree in Inclusive Elementary Special Education. She is dually certified in Childhood Education and Special Education. 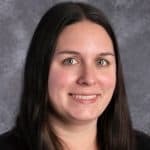 Kerri has worked in the Huntington School District as well as the Developmental Disabilities Institute as a Special Education Teacher, before joining us here at Divine Wisdom Catholic Academy. She is continually educating herself on aspects within the education field and believes that an engaging student centered approach is an effective teaching strategy. She looks forward to working in collaboration with students, teachers, and the Divine Wisdom Catholic Academy family.